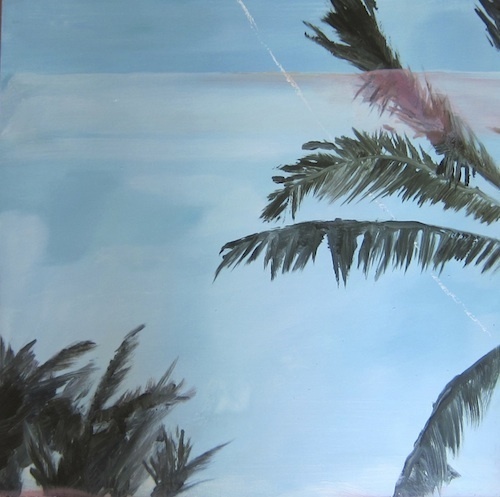 Holland Cunningham, Palms Sky, 2013, oil on masonite, 10 x 10”. From Milton Gendel’s reviews in Art News of Alberto Burri’s work to Cy Twombly’s perennial presence on the Italian peninsula, the postwar art scenes in Italy and the United States have long enjoyed a good degree of cross-fertilization. “On the Relativity of Distance (and Some of its Consequences)” takes up this intersection, the first part featuring work by artists practicing in both countries between the mid-1960s and the mid-1970s and the second segment featuring work by contemporary artists at the National Academy School who have worked under the sway of this earlier generation. Rather than tracing a precise genealogy of influence, curators Filippo Fossati and Maurizio Pellegrin have put into play a number of striking juxtapositions, letting the art speak for itself. In its cool, offhand absorption of Pop, the stenciled cover of Ed Ruscha’s Twentysix Gasoline Stations, 1963, echoes in Alighiero Boetti’s unfussy Manifesto, 1968, a list of fellow artists’ names. With coded symbols accompanying each name, however, the latter adds a subtle, conceptual dimension that speaks volumes about the decade’s intervening aesthetic trajectory. Holland Cunningham’s painting Palms Sky, 2013, seems to dialogue casually with John Baldessari’s Throwing Three Balls in the Air to Get a Straight Line (Best of Thirty-Six Attempts), 1973, while Carol Rama’s Bricolage, 1969, dialogues most forcefully with an early work by Piero Manzoni. Manzoni’s precedent loomed large for the Arte Povera generation, taking pride of place here with work by Pino Pascali and Giulio Paolini among others. Equally notable is the extent to which the more recent work on view has largely exchanged certain conceptual and minimal devices for a more straightforward figuration. Among newer pieces, Nicus Lucà’s Caravaggio, 2008, and Karen Lindsay’s photogram Constellations: Summer, 2012, with plantlike silhouettes set off against a striking blue, replay repeated looks in their formal detail.